The 1998 Good Friday peace agreement could become unsalvageable, Sinn Fein has said, as Brexit and other unresolved issues continue to shutter the institutions which were set up under the agreement. It is now two years since the late Martin McGuinness of Sinn Fein stepped aside as Deputy First Minister, pulling down the Stormont Executive over a giant corruption scandal. It was the last straw for powersharing, which had become unviable over its failure to deliver basic rights for northern nationalists or implement previous agreements. British civil servants now make Ministerial decisions, although the London government continues to deny there has been a return to full Direct Rule. Marking the anniversary of the collapse of Stormont, Sinn Fein negotiator Conor Murphy said: “There is no escaping from the catastrophic course that Westminster and the DUP are charting with a reckless Brexit agenda that is hurtling towards a no-deal crash come March. Chaotic efforts continue in London to reach a deal on Britain’s withdrawal from the EU. 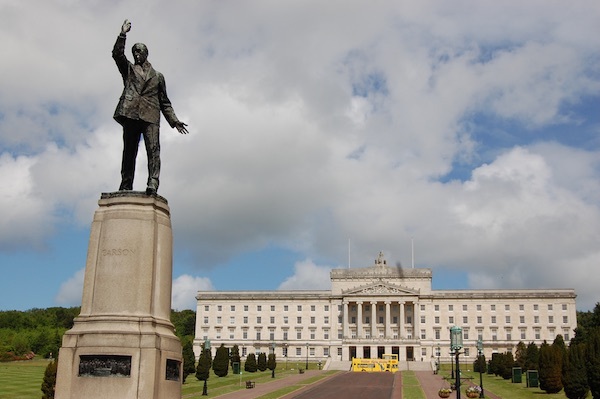 There weren suggestions that through a revived Stormont Assembly, the hardline unionist DUP could be given a veto over the deal’s ‘backstop’, which is intended prevent a return of a remilitarised border through Ireland. The idea was mooted by Theresa May in her latest attempt to win back the support of unionist MPs whose votes at Westminster she needs. But it was rejected out of hand by the Dublin government, as well as the DUP, for being unworkable. Another attempt to spike the backstop is being given a better chance of success.A parliamentary amendment calling for it to be time limited could hand Westminster a veto on whether to extend the Brexit transition period, or else trigger the backstop if no trade deal is concluded by the end of 2020. The DUP has said it is “closely studying” the wording of the amendment. It appears to contradict the terms of the deal and is unlikely to be acceptable to the EU, which has not yet commented. Sinn Fein’s leader Mary Lou McDonald urged EU chief negotiator Michel Barnier not to “blink” at a meeting in Brussels this week. She paid tribute to Mr Barnier’s and fellow member states’ “genuine” and “steadfast” commitment to protecting the Good Friday Agreement. In their discussion of the possibility of a crash ‘no-deal’ Brexit, Ms McDonald said that if Britain “crashes out, there will inevitably be a hardening of the border”. In those circumstances “it will be imperative to put the issue of the Border to the people of Ireland by referendum”, she said. The next logical step was for the Dublin government to start preparations for a referendum on unity. Even the British government appeared to accept that logic, the Sinn Fein leader noted. She cited reports that Britain’s Direct Ruler in the north of Ireland, Karen Bradley, had admitted to the British cabinet that a ‘border poll’ on reunification would inevitably have to be called in the event of a crash Brexit. DUP leader Arlene Foster said this was “obvious scaremongering” ahead of a crucial vote on Theresa May’s Brexit deal. The vote on the Withdrawal Agreement and its amendments should finally take place on Tuesday night.